CHICAGO (WLS) -- An emergency medical technician who crashed into a suburban building - killing three - had cocaine in his bloodstream, the ABC7 I-Team has learned. EMT James Wesley, 51, lost control and crashed into a building at 28th Avenue and Washington Boulevard in Bellwood. Wesley died instantly during the March 31 collision and his co-EMT Prentis Williams, 50, of Chicago and 48-year-old dialysis patient Larry Marshall Jr. were also killed. Documents obtained Monday by the I-Team under a Freedom of Information filing reveal that toxicology testing conducted by the Cook County Medical Examiner show Wesley had cocaine in his system. The I-Team has previously reported that Wesley had an extensive record of felony convictions, including drug possession, and should not legally have been behind the wheel of an ambulance on the day of the accident. He also had broadsided a car in a previous accident in 2010, resulting in injuries and damages that are still unpaid. According to the ME's report, Wesley had "significant chronic cardiac disease" and an autopsy "cannot confirm or deny that an acute cardiac event and/or cocaine intoxication contributed to motor vehicle collision." Heavy cocaine users may have an increased cardiac need for oxygen while at the same time cocaine restricts blood flow to the heart muscle-and can cause heart attacks. Two lawsuits naming Excel Ambulance Company have been filed in Cook County Court on behalf of EMT Williams and dialysis patient Marshall. "The ambulance company allowed this man to drive the ambulance when he clearly was not in a condition to be driving the ambulance" said Tom Zimmerman an attorney for the family of co-EMT Prentis Williams. He put passengers' lives at risk and he put other pedestrians and motorists at risk and it's as a result of a failure on behalf of the ambulance company to appropriately monitor its drivers and placing a clearly unfit individual behind the wheel of one of its ambulances." Complicating legal proceedings: according to county investigators this was an unlicensed and unregistered ambulance. Even though the ambulance was painted as an Excel vehicle, attorneys for Excel say it was actually owned by a now-defunct company and being rehabbed. They say EMT Wesley-who had cocaine in his system-took the ambulance from a garage, was somehow aware of patient transport schedules, and decided to freelance runs that day the accident occurred. "James Wesley knew the regular schedule" said Frank Nagorka an attorney for the now-defunct New Life ambulance company that he says owned the vehicle. "They had no idea he went to pick up this patient or that the ambulance was taken. He took the ambulance without permission. He (Wesley) was not authorized to take the ambulance" Nagorka said. Following our reports in early April, Illinois Department of Public Health officials examined Wesley's EMT licensing file. 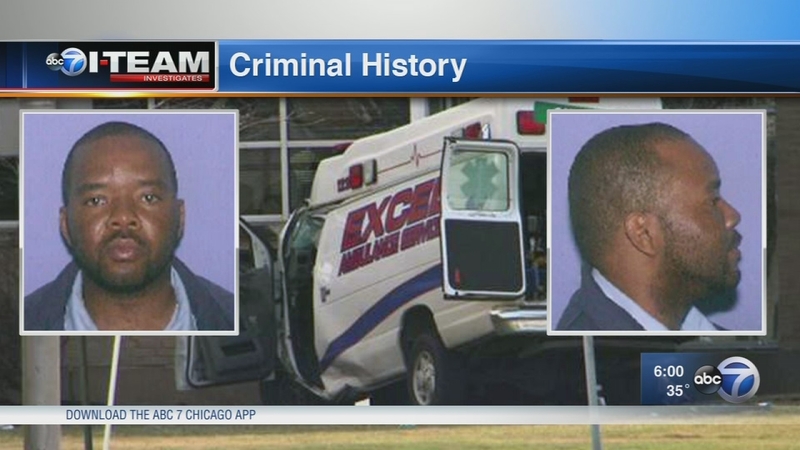 An emergency medical technician who crashed into a suburban building-killing three-did not disclose his criminal history as required to state regulators, the ABC7 I-Team has learned, and shouldn't have had his Illinois EMT license. "Mr. Wesley was required to inform IDPH of his felony convictions upon renewal of his EMT license in 2015, but he did not" said agency spokesperson Melaney Arnold at the time. EMT's respond to emergency calls, transport patients and provide medical care to the injured and critically ill.
Records show Wesley served time for felony crimes in both Illinois state prison and the Cook County Jail and was sentenced to participate in a drug treatment program in 1993. Under Illinois law, "all applicants for any license, permit or certification under the Act shall fully disclose any and all felony convictions in writing to the Department at the time of initial application or renewal. Failure to disclose all felony convictions on an application submitted to the Department shall be grounds for license denial or revocation." The state's licensing procedure of EMT's operates mostly on the honor system. While applicants are required to provide information of their criminal histories, if they falsify paperwork the state does not truth-squad their statements with background checks. On their license renewal form, EMT's must check one of two boxes: "I have NOT been convicted of a felony," or "I HAVE been convicted of a felony." Those who have been convicted of a felony must also attach a statement describing the incident. The renewal form is signed "under penalties of perjury." Following Wesley's previous accident in 2010, Illinois Secretary of State records show that Wesley lost his license. After regaining his license in 2013, Wesley was required to obtain specialized "high risk" insurance-which he was still required to have at the time of the ambulance crash in late March. Bellwood police officials say they are reviewing the autopsy results.